Intelligent AR (10.05.2017) - JUVENIA 2017 Avilés (Skateboard & Video game). Codes B5ES17 ES01 + B5ES17 ES02. Special imprint ' 10-13 mayo Avilés '. Pictorial first day cover with four ATMs, domestic mail (4 x Tarifa A). Special first day postmarks 'ATM Punto Filatélico' & 'JUVENIA MAXIESPAÑA 2017'. Intelligent AR (10.05.2017) - JUVENIA 2017 Avilés (Skateboard & Video game). Code B5ES17 ES01 - Kiosk installed at Aviles show. Special imprint ' 10-13 mayo Avilés '. Two mint ATMs, domestic mail (2 x Tarifa A). Intelligent AR (10.05.2017) - JUVENIA 2017 Avilés (Skateboard & Video game). Code B5ES17 ES01 - Kiosk installed at Aviles show. Special imprint ' 10-13 mayo Avilés '. Two mint ATMs, domestic mail (2 x Tarifa A) + first day of issue receipt. Intelligent AR (10.05.2017) - JUVENIA 2017 Avilés (Skateboard & Video game). Code B5ES17 ES01 - Kiosk installed at Avilés exhibition. Special imprint ' 10-13 mayo Avilés '. Two mint strips of four ATMs, domestic mail (2 x 4 x Tarifa A) + first day of issue receipts. Back number are the same on both sets. Intelligent AR (10.05.2017) - JUVENIA 2017 Avilés (Skateboard & Video game). Code B5ES17 ES01. Special imprint ' 10-13 mayo Avilés '. Two ATMs with each design, domestic mail (2 x 2 x Tarifa A). Special first day postmark 'ATM Punto Filatélico'. Intelligent AR (10.05.2017) - JUVENIA 2017 Avilés (Skateboard & Video game). Code B5ES17 ES01. Special imprint ' 10-13 mayo Avilés '. 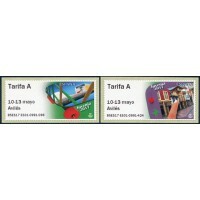 Pictorial first day cover with two ATMs, domestic mail (2 x Tarifa A). Special first day postmark 'ATM Punto Filatélico'. Intelligent AR (10.05.2017) - JUVENIA 2017 Avilés (Skateboard & Video game). Code B5ES17 ES01. Special imprint ' 10-13 mayo Avilés '. Two first day covers, domestic mail (2 x Tarifa A). Special first day postmark 'ATM Punto Filatélico'. Indexed. Intelligent AR (10.05.2017) - JUVENIA 2017 Avilés (Skateboard & Video game). Code B5ES17 ES01. Special imprint ' 10-13 mayo Avilés '. Two first day covers with the two 4-values set (2 x Tarifa A - A2 - B - C) + first day receipts. Special first day postmark 'ATM Punto Filatélico'. Intelligent AR (10.05.2017) - JUVENIA 2017 Avilés (Skateboard & Video game). Code B5ES17 ES01 - Kiosk installed at Aviles exhibition. Special imprint ' 10-13 mayo Avilés '. Two pictorial first day covers with the two 4-values set (2 x Tarifa A - A2 - B - C) + first day receipts. Special first day postmark 'ATM Punto Filatélico'. Intelligent AR (10.05.2017) - JUVENIA 2017 Avilés (Skateboard & Video game). Code B5ES17 ES01. Special imprint ' 10-13 mayo Avilés '. Eight first day covers mailed to different countries, franked with the two sets of four values (2 x Tarifa A - A2 - B - C) + first day receipts. Special first day postmark 'ATM Punto Filatélico'. Intelligent AR (10.05.2017) - JUVENIA 2017 Avilés (Skateboard & Video game). Code B5ES17 ES01. Special imprint ' 10-13 mayo Avilés '. Two REGISTERED first day covers, domestic mail (2 x Tarifa A). Tourist first day postmark Avilés post office. Indexed. Intelligent AR (10.05.2017) - JUVENIA 2017 Avilés (Skateboard & Video game). Code B5ES17 ES01. Special imprint ' 10-13 mayo Avilés '. Maximum card with ATM, domestic mail (Tarifa A). Special first day postmark 'ATM Punto Filatélico'. Intelligent AR (10.05.2017) - JUVENIA 2017 Avilés (Skateboard & Video game). Code B5ES17 ES01. Special imprint ' 10-13 mayo Avilés '. Maximum card with ATM, domestic mail (Tarifa A). Avilés tourist first day postmark, with a second postmark on the back of the card. Intelligent AR (10.05.2017) - JUVENIA 2017 Avilés (Skateboard & Video game). Code B5ES17 ES01 - Kiosk installed at Avilés exhibition. Special imprint ' 10-13 mayo Avilés '. Two mint sets of four values (2 x Tarifa A - A2 - B - C) + first day of issue receipts. Back number are the same on both sets. Intelligent AR (10.05.2017) - JUVENIA 2017 Avilés (Skateboard & Video game). Code B5ES17 ES02 - Counter printer installed at Aviles show. Special imprint ' 10-13 mayo Avilés '. Two mint ATMs, domestic mail (2 x Tarifa A). Intelligent AR (10.05.2017) - JUVENIA 2017 Avilés (Skateboard & Video game). Code B5ES17 ES02 - Counter printer installed at Aviles show. Special imprint ' 10-13 mayo Avilés '. Two mint ATMs, domestic mail (2 x Tarifa A) + first day of issue receipt. Intelligent AR (10.05.2017) - JUVENIA 2017 Avilés (Skateboard & Video game). Code B5ES17 ES02 - Printers installed at Avilés exhibition. Special imprint ' 10-13 mayo Avilés '. Two mint strips of four ATMs, domestic mail (2 x 4 x Tarifa A) + first day of issue receipts. Back number are the same on both sets. Intelligent AR (10.05.2017) - JUVENIA 2017 Avilés (Skateboard & Video game). Code B5ES17 ES02 - Counter printer. Special imprint ' 10-13 mayo Avilés '. Pictorial first day cover with two ATMs, domestic mail (2 x Tarifa A). Special first day postmark 'JUVENIA MAXIESPAÑA 2017'. Intelligent AR (10.05.2017) - JUVENIA 2017 Avilés (Skateboard & Video game). Code B5ES17 ES02 - Counter printers installed at Aviles exhibition. Special imprint ' 10-13 mayo Avilés '. Two first day covers, domestic mail (2 x Tarifa A). Special first day postmark 'ATM Punto Filatélico'. Indexed. Intelligent AR (10.05.2017) - JUVENIA 2017 Avilés (Skateboard & Video game). Code B5ES17 ES02 - Counter printers installed at Aviles exhibition. Special imprint ' 10-13 mayo Avilés '. Two pictorial first day covers with the two 4-values set (2 x Tarifa A - A2 - B - C) + first day receipts. Special first day postmark 'ATM Punto Filatélico'. Intelligent AR (10.05.2017) - JUVENIA 2017 Avilés (Skateboard & Video game). Code B5ES17 ES02 - Counter printers installed at Aviles exhibition. Special imprint ' 10-13 mayo Avilés '. Two first day covers with the two 4-values set (2 x Tarifa A - A2 - B - C) + first day receipts. Special first day postmark 'ATM Punto Filatélico'. Intelligent AR (10.05.2017) - JUVENIA 2017 Avilés (Skateboard & Video game). Code B5ES17 ES02. Special imprint ' 10-13 mayo Avilés '. Maximum card with ATM, domestic mail (Tarifa A). Special first day postmark 'ATM Punto Filatélico'.